Designed to stand out both within the Toyota line-up and in its segment, it represents Akio Toyoda’s determination to allow greater stylistic freedom and promote engineering creativity in order to achieve eye-catching designs and enhanced driving pleasure. To the rear, the strongly tapered cabin integrates the back door while securing luggage space. This contrasts with the pronounced flaring of the wheel arches to give the new crossover a wide and extremely powerful stance. 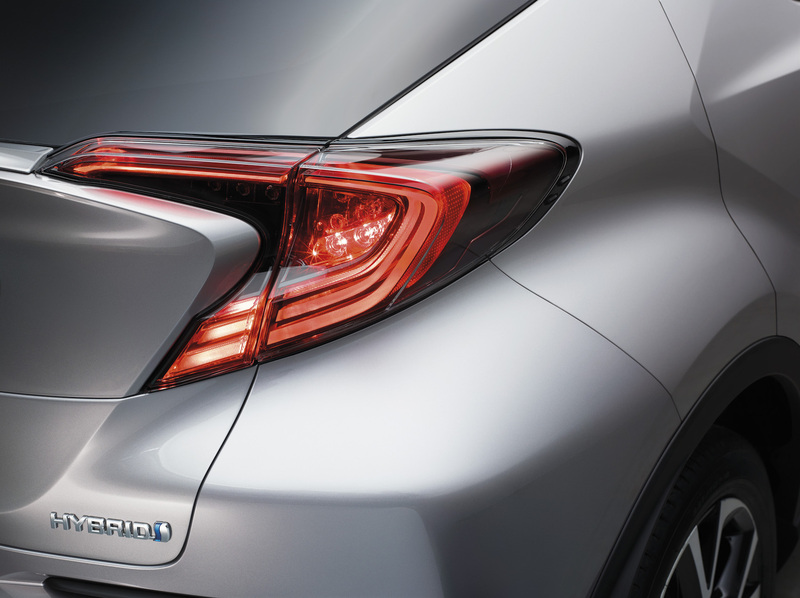 Standing proud of the tapering body work, prominent rear light clusters may also be equipped with LED lamp technology to give the C-HR an equally expressive rear light visual signature. This car is the result of a global cooperation between design centres on three continents and was managed by Project Chief Designer Kazuhiko Isawa. The original exterior design was created by Calty, the Toyota design studio in California. The C-HR will be equipped with two powertrains in the UK including the latest-generation full hybrid power plant: With CO2 emissions of less than 90 g/km it is unrivalled within its segment. Delivering 122 DIN hp, this new hybrid powertrain is more efficient and lighter, and offers sharper performance than previous hybrid systems. Detailed design changes to the engine have resulted in a thermal efficiency of 40% – a world-beating performance for a petrol unit. Other hybrid system components have been made lighter and smaller, and have been repositioned for optimum packaging, further contributing to the car’s lower centre of gravity. Alternatively, the Toyota C-HR is available with the new 115 DIN hp/85 kW 1.2 litre turbo engine, (first shown in the Auris). This will have a choice of 6-speed manual gearbox or a Continuously Variable automatic Transmission system, which is developed to meet expectations in response and direct feel for European customers familiar with manual and automatic gearboxes. The CVT is available in front-wheel or 4-wheel drive versions. A 2.0-litre CVT-only model will also be available but only for certain markets, (not for UK). Our photographer was on hand at the Geneva motor show to take some great photographs of the Toyota C-HR as it was unveiled. See the moment the Toyota C-HR was unveiled at the Geneva motor show. 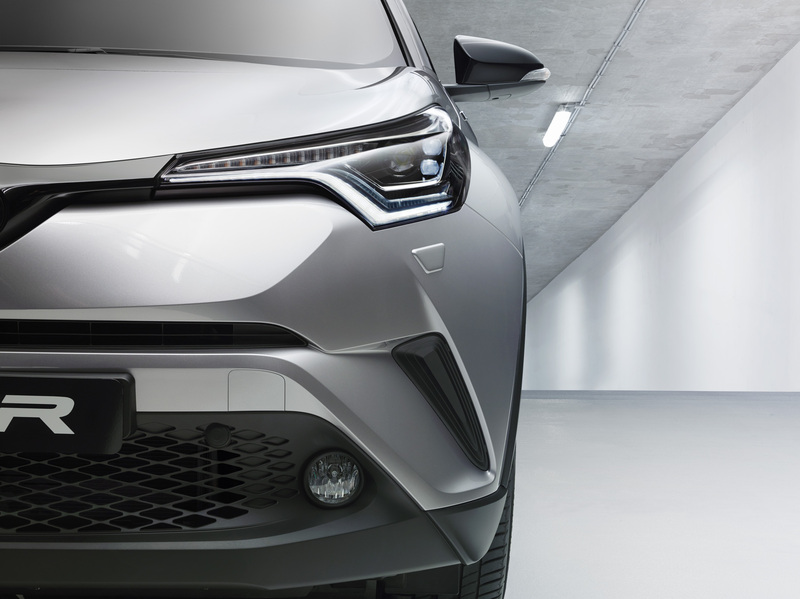 The front of the Toyota C-HR shows the further development of the Toyota Under Priority and Keen Look design identity. 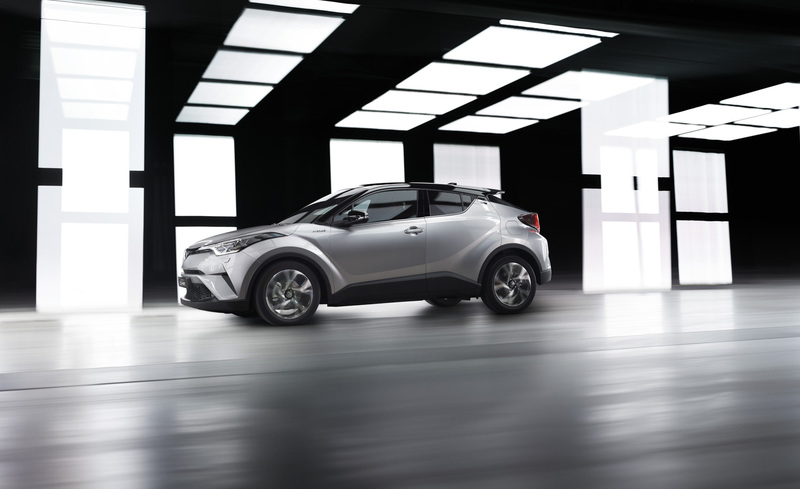 Toyota C-HR stands for Coupe-High Rider, again highlighting its sleek, crossover design. The Toyota C-HR will be built at Toyota Motor Manufacturing Turkey, while the hybrid powertrain will be produced at Toyota Manufacturing UK’s engine plant in Deeside, North Wales. The Toyota C-HR sits in the heart of the C-Crossover segment. What this means is that the C-HR is just 4cm shorter than the previous generation RAV4 and longer than the Honda HR-V, Mazda CX-3 and Nissan Juke. What a waste of a nice design. No 4wd and a weak engine with the top model only having 122bhp. As a previous Rav buyer (when it used to be known as the GTi off roader), it just shows how low Toyota have sunk and how far out of touch they are with the UK market that wants performance with green credentials not just green. Tesla have it right, 0-62 in 2.9 secs from a totally electric car. Even more direct competitors such as VW are building cars such as the Tiguan with engine choices ranging from 140 bhp at the low end through 190, 220 and 240bhp (forthcoming Tiguan Biturbo). The forthcoming Tiguan hybrid GTE is rumoured to be 220bhp. Been some styling tweeks for the road? Two things that immediately stand out are the massive reduction in wheel size, the loss of those wonderful concept wheels and the move from led running lights in the vent scoop to round projectors in the valance. Takes the design quality massively backwards. C-HR is an affordable vehicle, the Hybrid power train has been tweaked to provide a more dynamic driving experience and design is subjective. We’ve had thousands of potential customers showing a solid interest in the vehicle. We will pass your feedback on to our team. Many thanks! It is clear that this new model has failed to meet quality/production targets. I like many others were looking forward to ordering for 2016 delivery. I now feel that the ongoing saga of this Toyota fails to inspire. Will have to disappoint my wife & find an alternative for her December birthday! good luck to all of you that are waiting. Hi Anthony. Thanks for getting in touch, and we apologise for the delay in response. C-HR will be with us by Autumn 2016. You can sign up for the latest news regarding it, here: po.st/ToyotaCHR. Thank you again. Thank you for your post and interest about Toyota C-HR. Unfortunately we are unable to confirm when C-HR will appear in dealerships. However keep an eye on our blog for all the latest news and features. Many thanks. The original concept of this was truly amazing, it is truly sad they destroyed it. Why put the time and effort into a car that everyone loved and turn it into just another suv/crossover. I was really looking forward for the C-HR to come out to purchase one for myself however with the new model that wont be happening…. We’re sorry you feel that way Derrick, but we have to disagree. The final production model is very close to the concept, save for a few differences to ensure it is legal on the road. We take a look at these differences here: po.st/SsAhnx. We hope you’ll still consider giving the C-HR a test drive when it’s available. It would be a shame for you to write it off on looks alone. Thank you for your post. Please keep an eye on our blog for all the latest news and features. Many thanks. Thank you for your post. We will pass your comments on to our product department. Hope this helps and if you have any more questions please let us know. Are you taking provisional orders for 2016 delivery in UK? Thank you for your post. Full technical specifications, grades, and order dates will be made available throughout this year, therefore stay tuned to our blog for more news. Many thanks. What are the expected tyre size options for this? I see the Geneva show car has 225/50/R18 but will there also be a higher profile tyre e.g. 17 inch? And please can you make the higher profile tyre available as an option in several car grades, not just the entry level version? Thank you for your post. Full technical specifications and grades will be made available throughout this year, therefore stay tuned to our blog for more news. Many thanks. Hi, why not AWD with the hybrid in the UK, surely there’s the market with our climate? Thanks Charlotte, it looks awesome but 4wd hybrid would make it even better for me! The website above only mentions the 1.2 turbo engine in CTV form as being available in AWD. Will you please confirm AWD will be available on the manual gearbox of this engine. Thank you for your post. Prices and specifications can change and will be confirmed later on this year. Therefore we would suggest keeping an eye on our blog for the latest news. Hope this helps and if you have any other questions please let us know. What will the starting price be? Thank you for your post. 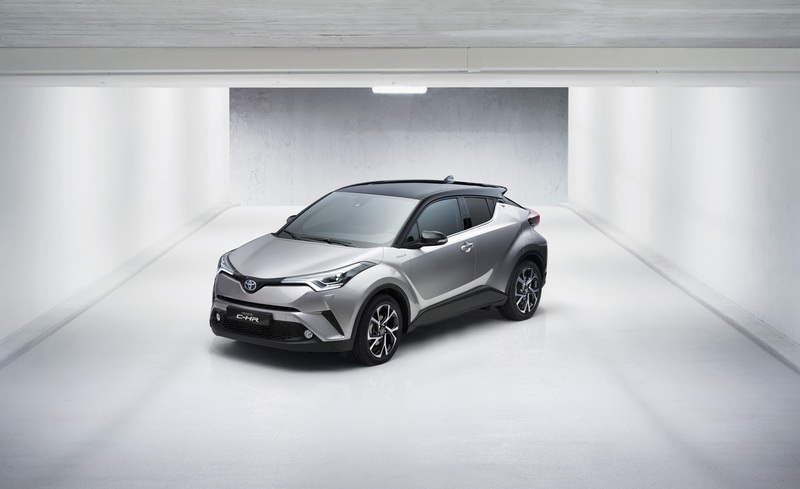 C-HR price and specifications will be released later on this year, so keep an eye on our blog for the latest news. Many thanks. What is the expected selling price in the UK? Disappointing the hybrid won’t be getting AWD. I was looking forward to getting a Prius with E-Four AWD, but then thought I’d wait for the C-HR. I guess I’ll just keep waiting. wow its very cool. 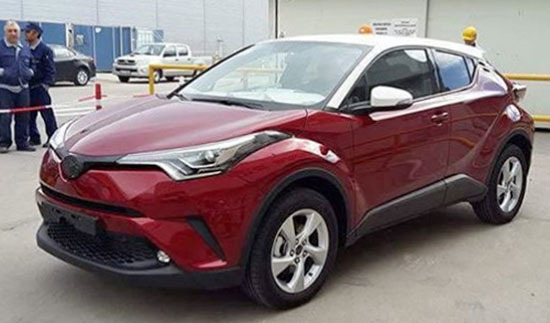 hope will enter Indonesia very soon..
“C-HR is just 4cm shorter than the RAV4” ?? RAV4 is 22 cm longer, completely different segment. It seems that it’s misunderstanding with Nissan Qashqai. Thank you for your post. C-HR is 4cm shorter than the previous generation RAV4, however C-HR is 25.5cm shorter than the new generation RAV4 Hybrid. Many thanks. Will the HSD version have exact same powertrain as Prius Gen 4? If so, 0-60 performance is not going to be as good as the Prius because the C-HR is likely to be heavier and higher drag coefficient. Is that a fair comment? Thank you fro your post. Prices and specifications can change and will be confirmed later on this year. Therefore we would suggest keeping an eye on our blog for the latest news. Hope this helps and if you have any other questions please let us know. Did you have interior pict and how about price? I understand that AWD is available for all CVT whether it be hybrid or just petrol. Is that correct? When will it arrive in the showroom? Thank you for your post. C-HR will be in dealerships by the end of this year. Many thanks. Will the Hybrid version come with an AWD option in the UK ? Hi JayZ. The hybrid version is only available in front-wheel drive. AWD is available on the 1.2T model.